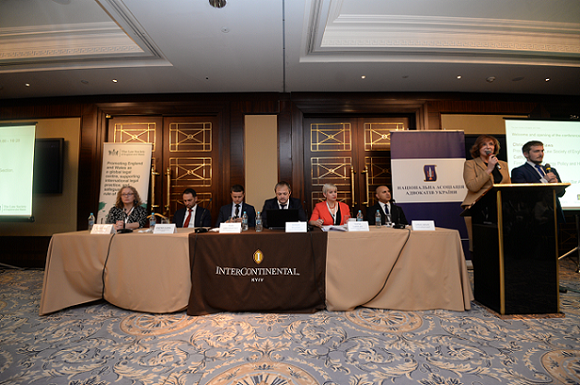 On 21 March III English Law Day Forum traditionally gathered together outstanding Ukrainian and English lawyers to discuss key legal issues and exchange ideas. Such major events like this are a great way to form and improve relationships between the two jurisdictions, while the relationships between Ukraine and the UK are strong and only getting stronger. The UK is known as a popular investment destination, so the forum was meant to provide more information and discuss significant aspects of international business management, start-ups, cross-border cooperation, effective dispute resolution and other topical questions. Christina Blacklaws, President of the Law Society of England and Wales, opened the conference and noted that the main vision of society is to ensure access to justice, protect fundamental freedoms and human rights, to provide access to knowledge and share their best experience with colleagues all over the globe, because no jurisdiction works in isolation. She also stated that English jurisdiction is the jurisdiction of choice for resolution of many issues, even when a dispute has no connection to a regional jurisdiction. That is why international cooperation is a major part of the work and strategy of the Law Society of England and Wales. President of the Ukrainian National Bar Association, Lidiya Izovitova, mentioned that the annual meeting has become a good tradition and each participant has personal goals, while foreign lawyers came to learn more about the Ukrainian legal services market and the investment climate, their local colleagues aim to reach international standards and to discover what is going on in England and what the investment climate is like there. ​During the event participants shared their experience related to cross-border and international legal matters and cooperation with English and Welsh solicitors on these issues, main points of doing business in the UK, which was quite valuable for representatives of both the UK and Ukraine.